Sorry. I am a little late for French Fridays this week. Know what I was lost in the aisles of the grocery store trying to figure out where to get the smoked salmon and roast beef from.... And had it not been for Nana, I would still be looking. The thing is, in India we do not have a deli counter. You buy your fruits and vegetables from the local farmers, fresh river water fish at the fish market and lamb and chicken from the butchers. Frozen and tinned foods are relatively recent introductions into the Indian market but the common man still does not indulge much into them. At least not in the small towns. So it did not strike us for once that the fish and meat might be there in the deli counter.. Thanks to Nana for mentioning the deli, we finally got the ingredients for the tartines yesterday and I fixed them for our Sunday brunch. Both the tartines were easy to fix. 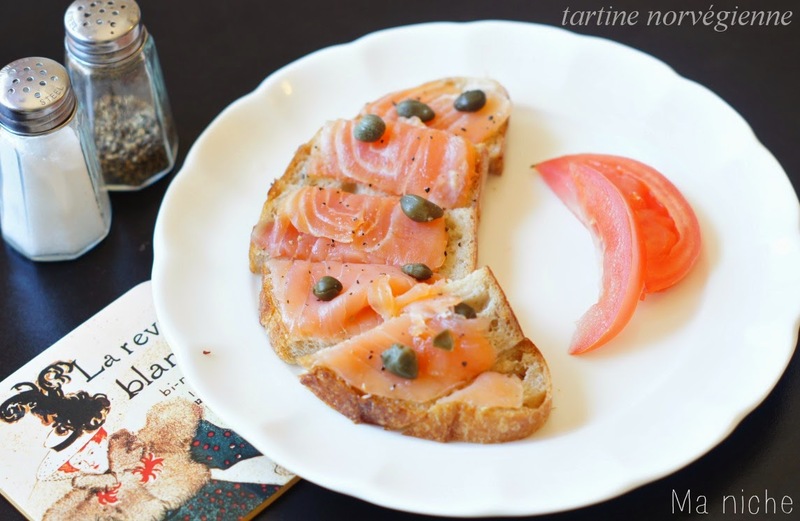 All I had to do was to toast two slices of bread, slather one with butter, another with mayonnaise, place paper thin slices of smoked salmon and rarest roast beef on them, season them appropriately, then top the fish tartine with capers, mayo-beef tartine with gherkin, cut both into 1 inch strips and serve. 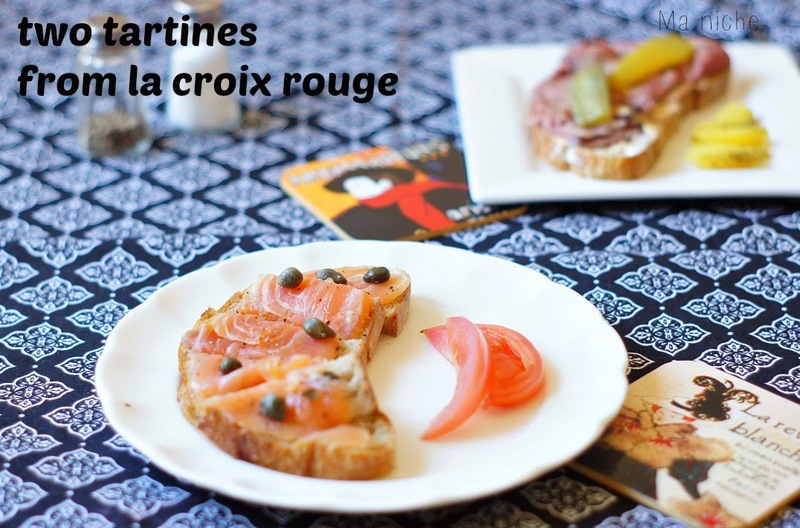 Oh, in La Croix Rouge, the cafe where these tartines are served, the fish tartine is accompanied by wedges of lemon. However, I substituted those with thin slices of tomato just because there were no lemons and plenty of tomatoes in the house. 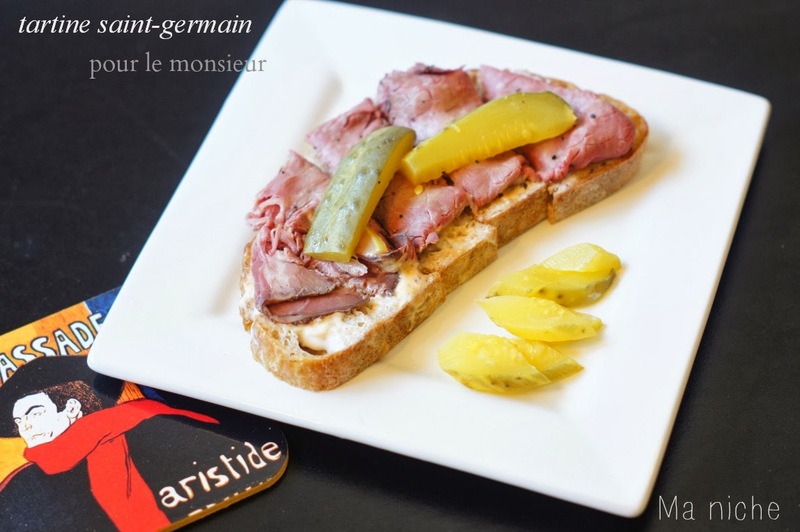 I think my husband was more impressed with his tartine saint germain than I was with my tartine norvégienne.. but then he enjoys his beef more than I enjoy smoked salmon... so that was expected. Anyway, I am glad that I did not skip this French Friday's assignment, for it is good to have easy and healthy fix up like these in ones repertoire. 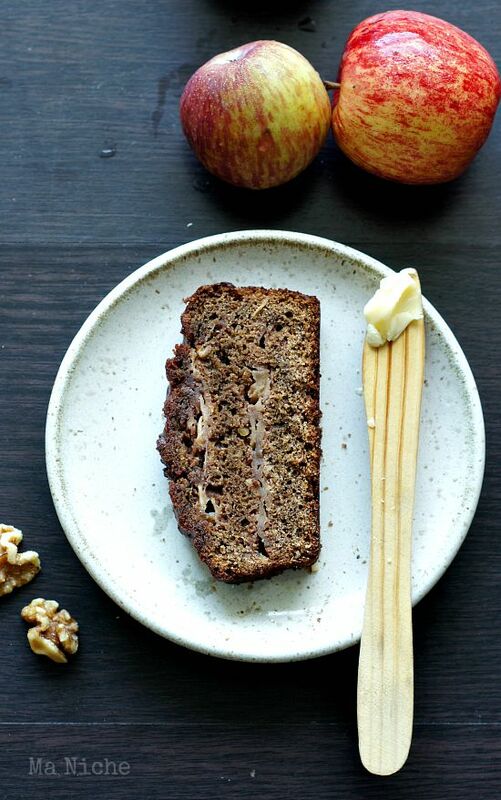 It just makes lunch simpler on busy days. 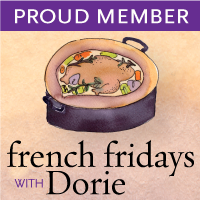 Visit French Fridays with Dorie to know what the other members thought about the tartines. Though these were non-recipes, you if like you can find their details in Dorie Greenspan's book Around my French Table. Nice job! I'm glad to hear you found what you needed in a deli. I think we're moving back to supporting stand-alone butchers, bakers, and fishmongers here. 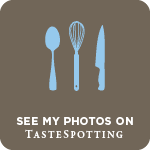 You got great looking stuff on toast there!